For a schedule of upcoming workshops, click here. Susan has been married for over 40 years to Jim Vogt. They live in Covington, Kentucky and have four young adult children who wander the world in search of meaning..
Susan is a speaker and award winning author. She is committed to helping you enrich your marriage, inspire your children, deepen your faith, and simplify your life. For many years, she was the editor of the Journal of the National Association of Catholic Family Life Ministers and content editor for the USCCB website on marriage. Susan has worked in family ministry for the Catholic Church for over 30 years designing and leading marriage, parenting, and leadership programs. A counselor by training, she has taught on the high school and university level. Susan and her husband, Jim, have worked with ecumenical and social justice organizations including Parenting for Peace and Justice. She has written five books. • Certified Couples Communication leader by Interpersonal Communication Programs, Inc.
Susan has spoken to groups across the U.S.A. as well as in Japan, Kenya, South Korea, India, the Philippines, and Guam. She leads interactive workshops that leave audiences with practical ideas for a more meaningful and satisfying life. Trivia note: Susan gave away one thing a day for a year and ate on $4.50/day for six weeks. Although a committed Catholic, Susan is also committed to helping others find and deepen their own spirituality wherever the Spirit may lead. She is a vowed member of the Marianist Family of Mary, a lay branch of the Marianist religious order. She has helped found two lay Christian communities and is currently a member of Anawim, a Christian community in the Catholic and Marianist tradition. She serves on the International Team of Marianist Laity representing North America, Asia, Australia, and Ireland. Jim is national director of the Marianist Social Justice Collaborative. Previously he was national administrator for the Parenting for Peace and Justice Network. His career has spanned working as an urban planner in Cincinnati to being a house husband. He has an MA in Urban Affairs from the University of Wisconsin and is also certified by Couples Communication and ACME in marriage enrichment. 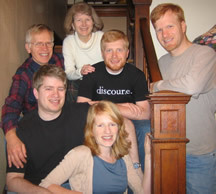 Jim is one of the authors of the Family Pledge of Nonviolence. Jim is also a lifelong Catholic and a vowed lay Marianist. Our 15 years as Co-Directors of the Family Ministry Office of the Diocese of Covington, KY gave us experience in job sharing. We split one full time job allowing one of us to be home with our children while they were young. This gave us a foot in both worlds. We have founded or led lay Christian communities in Cleveland, Kalamazoo, and Cincinnati. We both currently work out of our home. Piecing together our many professional and volunteer jobs has been fascinating and fulfilling work. In our spare time we love to contradance and visit our children who wander the world. To see full vitaes, click here. "Listening to Susan is well worth your time. She blends family with justice themes. No guilt, just the honest truth based on lots of experience." "Susan addresses all the tough issues parents face in raising kids. Drawing from Christian values she guides parents in nurturing a social conscience in children with clarity, enthusiasm, and humor."